November is the month for party & celebration in my house. Other than regular festivals we have 4 birthdays and 2 wedding anniversaries to celebrate and out of these 6 celebrations 5 fall within the period of 10 days . This year I decided not to bake any cakes for anniversaries but for birthday's no excuse. So today I'm sharing this birthday cake I baked for my little one, she is two now, independent enough to do everything by herself(at least that's what she thinks). She had lots of fun whole day singing her b'day song...."Happy birday toote cakeah" and do I need to say the girl enjoyed the cake as much as she enjoyed singing her b'day song. Mix all the dry ingredients & sift them to make sure no lumps are there. Cream butter & sugar. Add buttermilk or dahi. Mix it. Slowly add dry ingredients & mix everything together. Divide the batter into two 7 inches greased pans & bake them in pre heated oven at 350 degree F till the tooth pick inserted comes out clean. In the mean time while cake is cooling mix the water & sugar & make a syrup. Keep it in the fridge. Whip up the cream with confectioner sugar to stiff consistency. (* see Baker's Notes) Keep it cold by placing it in the fridge when not working with it. Keep one cake onto cake board/serving plate, using a pastry brush drizzle/rub some syrup into it. Spread some whipped cream, around 1/2 inch thick layer & sprinkle some M'n'M's(see Notes if using cherries) onto it. Now put second cake upside down on it (* see Baker's Note at the bottom). Drizzle some syrup onto it. Using a offset spatula spread some icing on all the sides, if U have a turntable make sure to use it here because it really makes it easy. If icing on sides is not very smooth don't worry as in any case chocolate shavings will cover the sides. After icing on the sides ice the top of the cake, smooth it out. Now come the most tedious or U can call it fun part decorating the sides with the chocolate shavings. I did it the way I've always done it. Before starting with icing I always cut 4-5 strips of wax/parchment paper around 4-5 inch wide put them around & under the cake in a way so that half of the strip(width wise) is under the cake, so in case if icing etc. fell on the cake platter it's much easy to clean. Now either use your hands directly or put some choc. shavings on a piece of parchment paper & try to put it on to the edges.....icing will work as glue and will hold the shavings but there will be lot of chocolate shavings falling down & will get sticky & melty too so when it's done, to clean up U just pull the strips at the end and as a bonus U get to lick all that chocolate which falls on these strips...BUT now this is tedious way that's what I think & till now I never thought about googling it also as I normally decorate a cake once in a while(and my kids in routine are happy with some lots of whip cream & sprinkles on top). But now as I was writing this post thought about checking on web about same issue.....except the first result of my search nothing else(at least on the first page) delivered what I was looking for but that one result does answer this problem(click here if interested) and next time I'm gonna try that and yes it will change the sequence of steps in the filling & assembly part as according to that forum this should be the first step. Decorate the top of the cake as U wish with M'nM's or cherries or cover it totally with chocolate shavings. Click of Baby Black Forest (it's hardly 4-5 inches in diameter) I made last year when hubby dear said no to Black Forest cake for his b'day (made after his b'day to satisfy my craving) & instead he wanted this one. If using cherries drain & de-seed them. For filling crush some cherries and spread them inside the layer along with the whip cream, making sure do not spread them to the edges, keep at least 1 inch margin from the edge of the cake, otherwise when U put the second layer on top of it filling will come out. Try to handle grated chocolate gently as it will melt quickly with your body heat. Whenever U want to decorate a cake make sure to use downside up(or call it upside down) because that's the smooth side. When whipping the cream make sure the bowl, whisk & cream everything is chilled otherwise it might not give U the right results. Off goes this cake to Champa for her weekly bake-off. The cake looks beautiful dear and looks like the kido enjoyed eating it thoroughly. 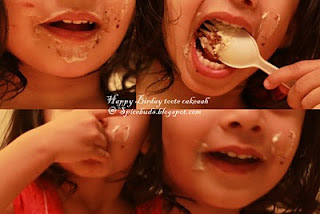 Belated happy b'day to your little princess :-) Pictures are assuring that your cake was HIT !! Happy Birthday to your little one. My two kids' birthday comes back to back. I feel exhausted by that itself. So many celebrations within a span of 10 days, god help you. Thanks for the entry and the cake looks fabulous. Belated Bday wishes.. Awesome cake! My son's favorite cake is black forest (no cherries), thanks for your recipe, can't wait to give it a go. Happy Birthday to the precious one. Black Forest is my very favorite cake and even without cherries this looks wonderful. 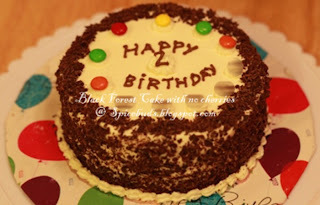 lovely cake and lovely blog! am new to ur place.. gorgeous! Happy Birthday! Mine is Monday and my kids are coming to celebrate; love your cake. Would love to try this egg less version of yours soon. I like cakes baked with curd. This cake is a great idea for someone who is allergic to eggs, love the flavors of black forest, but have yet to try making it at home!